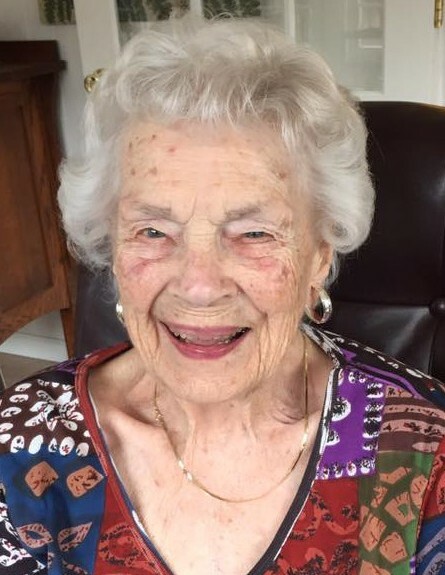 Obituary for Ethel G. (Hafermalz) Simmons | TRAUB FUNERAL HOME INC.
Ethel G. Simmons, age 103, died June 1st 2018 at Cornerstone Hospice in the Villages, Florida. She was born February 12 1915 in Syracuse, New york, the youngest daughter of William and Rose Hafermalz. Ethel lived on Oneida Lake, first in Brewerton and then in Constantia. She met her husband Delbert A Simmons while working in her parents restaurant in Brewerton. They were married for 62 years and raised four children. A wonderful mother and friend to her children and grandchildren, she was always there when we needed her. Her love of living on the lake and being with family and friends gave her a century of memories. Preceding her in death were her husband Del and her brothers William and Walter Hafermalz and a sister Rose Grey also a grandson Jeffrey Simmons. Ethel leaves four children, Jim Simmons, Janet Riccelli (Sam), John Simmons (Jane) and Joan Lanker (Gordon). Also surviving are ten grandchildren, nineteen great grandchildren and four great great grandchildren. She attended the United Methodist church in Constantia and was a member of the Oneida Lake Chapter 123 Order of the Eastern Star and a past Matron. Services are being held on Tuesday, June 12, 2018, 11 AM, at Traub Funeral Home in Central Square.